READ: How Arizona Representatives Voted On "Student Loan Rate Fix" - Only One Voted "Nay"
The U.S. House of Representatives overwhelmingly (392-31) voted this evening to send a student loan rate fix to the President's desk; as might be expected with that kind of vote margin, eight of Arizona's nine Congresspeople voted in favor. Rep. Raul Grijalva (D-CD3) was the lone "nay" vote from the Grand Canyon State, and he said afterward that "we shouldn’t charge students more to borrow for college than we charge banks.” His entire statement is below the jump. Rep. Ron Barber (D-CD2) explained his "aye" vote by saying that he was not happy about the bill, but that he thought it important "to create certainty for students as they enter this school year. “In the long run, we need a better solution that will protect students from high interest rates and ensures that rates remain stable. This bill fails to do that. I call on leadership in the House and Senate to come back to the table and pass real protections for students that will keep college affordable.” Barber's entire statement is also below the jump. Opinions vs. facts: U.S. Senator Jeff Flake (R-AZ) may be the "Most Beautiful" person on Capitol Hill, as determined by TheHill.com - and it may hide an "ugly reality", as determined by a key opinion columnist at The Arizona Republic - but when he moved from the House of Representatives to the U.S. Senate this year, the fact is that Flake himself quietly shed the "Porkbuster" label. In 2007, then-Rep. Jeff Flake started his leadership PAC, and decided to call it the Porkbuster Political Action Committee. This past December, his accountant filed Porkbuster's 2012 post-general finance report. Then, just before moving over to the Senate, without any fanfare, Flake changed the name of his leadership PAC. The amended statement of organization - filed on January 2, 2013 - simply drops the long-standing porkbuster moniker in favor of an eponymous acronym. The leadership PAC shall henceforth be known as the Fiscal Leadership And Knowing Economics PAC - FLAKE PAC, for short. * Not as unique or descriptive, but certainly more befitting the more dignified, rarefied air of the Senate. *Pursuant to federal election laws, members of Congress are not allowed to use their name in the name of his or her leadership PAC; eponymous acronyms are apparently OK, and seem to have become almost de rigeur. **An FEC spokesperson confirmed to Arizona's Politics that it is okay for leadership PAC's to raise money for its affiliated committees. Tomorrow marks the first day of early voting in Phoenix City Council races. And, it marks the first day of a $231,000 advertising campaign to be unleashed by an Arizona firefighters' union. The ad - which has yet to be unveiled - will attack Phoenix Councilmember Sal DiCiccio, who is facing union-endorsed Karlene Keogh Parks. Arizona's Politics learned of the advertising blitz from FCC documents filed by KPNX (Channel 12) yesterday. The TV station and Phoenix Truth and Safety - the committee organized and financed by the Professional Firefighters of Arizona ("PFFA") union - lists the 30-second spot as an "Issue/Non-Ballot" related commercial. The timing of the spot certainly makes it appear otherwise, but Arizona's statutes and case law has given organizations wide latitude in that regard. The anti-DiCiccio ad is currently scheduled to begin running Thursday morning during the Today Show and will continue airing during news blocks through August 23. Election day is August 27. The ad will likely be running on other Phoenix television stations, but that is either not firm or they have not yet filed their reports with the Federal Communications Commission. Phoenix Truth and Safety is also visible in their anti-DiCiccio campaign by the perhaps-too-clever signs blanketing Council District 6 (central Phoenix and the Ahwatukee area of Phoenix) "boasting" that "lobbyists" and "developers" support DiCiccio. Arizona's Politics will update this article once a copy of the ad becomes available. Arizona Sen. John McCain (R-AZ) does not like the analysis about Syria that Gen. Martin Dempsey provided, but he will not block his nomination for another term as Chairperson of the Joint Chiefs of Staff. McCain had made headlines this past week when he announced that he would block the re-nomination until satisfactory answers to his (and Sen. Carl Levin's) questions were provided. The letter from Gen. Dempsey is below. McCain said he was disappointed in the letter, but would not block the nomination: "This assessment that Gen. Dempsey gave of how to address the challenges in Syria are beyond anything that any rational military thinker that I know would ever contemplate." The Judge deciding whether or not to rule on the merits of the lawsuit filed by friends of Maricopa County Sheriff Joe Arpaio to declare an attempted recall against him as being unconstitutional has agreed to let high-profile attorney Larry Klayman out of the case, after he apparently mislead the court (and his co-counsel) into believing that he had filed paperwork with the Arizona Bar. Maricopa County Superior Court Judge Lisa Flores signed the Order Rescinding the Pro Hac Vice Admission of Larry Klayman (minute entry below), following the somewhat-surprising acknowledgment that Klayman had NOT in fact filed the application with the State Bar of Arizona necessary for an out-of-state attorney to represent Citizens To Protect Fair Elections in an Arizona Court, and that he had represented to the Court that the application was filed. The State Bar confirmed to Arizona's Politics that Klayman's actions are being investigated. The plaintiffs are now being solely represented by former Arizona lawmaker - and current candidate for a District 15 House seat - David Burnell Smith. Burnell Smith has reversed the strategy that Klayman apparently controlled regarding continuing the legal action even after the recall effort failed to turn in petition signatures at the May 30 deadline. Klayman told Arizona's Politics and the Court that there still needed to be a ruling on the merits of the case because it was a matter capable of repetition yet avoiding judicial review (much like the issue that led to the Supreme Court's Roe v. Wade ruling in 1973). The risk for Klayman and Burnell Smith in that strategy was (is) that the recall defendants also have a pending Motion for Sanctions against both the Plaintiffs and their legal counsel. That may explain why Burnell Smith began asking all of the defendants (including Maricopa County, which would have had to conduct the recall election if the Arpaio opponents had been successful) before the July 11 status conference if they would stipulate to dismiss the entire case. At the July 11 telephonic status hearing, the Judge did dismiss the County defendants, but listened to Respect Arizona's (the committee that was coordinating the recall effort) counsel, Christopher Ford, use Klayman's rationale to argue for a ruling on the merits. The Minute Entry (posted below) indicates that Ford offered to forego oral argument on the complaint and the motions, and Burnell Smith then (in a motion filed July 18) withdrew his request for oral argument. However, Ford tells Arizona's Politics that he does hope that the Judge still plans to rule on the merits; he was not pleased that Burnell Smith is trying to avoid the Motion for Sanctions: "Arpaio's yes-men brought this frivolous lawsuit as part of a multiprong effort to thwart Respect Arizona's recall effort, and unfortunately their tactics were successful on the political stage, but now that their legal positions are to withstand court scrutiny, they run for cover. Judge Flores is now "determin(ing)" whether she wishes to hear oral argument anyway; alternatively, she could decide to argue on the merits and the sanctions request based on the pleadings, or refuse to rule on the merits and dismiss the remains of the case. The issue that the Plaintiffs' based their complaint on is that the recall effort violated the Arizona Constitution by filing the recall within six months of the Sheriff being sworn in for his sixth term; the Constitutional provision does not define whether it only applies to the six-month period after an elected official's first term, or whether a new six-month period starts each time the official wins re-election and is sworn in for a subsequent term. The Arizona statutes do specify that it only applies to the first time the official is elected; plaintiffs claim that statute is unconstitutional. Arizona Senator John McCain's Sunday news shows generally generate national news headlines on an otherwise slow news day, and today's appearance on CNN's "State of the Union" was no exception. One of the national headlines was even Arizona-related, as the Senator indicated that he is confident that his home state's Legislature will review Arizona's "stand your ground" law in the wake of the George Zimmerman/Trayvon Martin verdict, and President Obama's "impressive" remarks about it this past week. However, McCain's primary takeaway from the President's remarks is that he (McCain) needs to spend more time talking to Arizona's Hispanic and African-American organizations. "What I got out of the president's statement, which I thought was very impressive, is that we need to have more conversation in America. I need to -- I, as an elected official, I need to talk more to my Hispanic organizations in my state. I need to talk to more African- American organizations. I need Americans to talk to their friends and neighbors, not just those on their block or their circle of friends." Arizona's Politics will follow up with the Senator's office about follow-through on this statement. And, if you are involved in an African-American or Hispanic organization that is contacted by his office, please drop Arizona's Politics an e-mail or phone call. Here is the entire interview - in four parts - and the transcript is below the jump. Arizona's nine Congresspeople filed their campaign finance reports for the second quarter, and the results varied widely. From only $9,500 in the bank on June 30 (Franks) to a war chest of $1.35 million (Pastor), and from $24,000 raised during the three months (Franks) to a haul of nearly $400,000 (Sinema), the reports reflect the differing natures of the Congressional Districts and the priorities of the Representatives. Arizona's Politics has already profiled the finance reports of the incumbents and challengers in CD9 (Sinema) and CD2 (Barber), and will do so for CD3 (Grijalva). But, here, in order of monies raised, are some basic numbers and notes for the nine incumbents. Sinema: The first-term Democrat in the closely-divided metro Phoenix CD9 is preparing for a difficult contest against whichever of the four (currently-announced) GOP candidates emerges from the primary. She raised $387,557.12 in the 2nd quarter, bringing her total to more than $712,000. More importantly, her cash on hand grew from $307,000 at the beginning of the quarter to nearly $550,000 on June 30. As noted in the previous article, she raised approximately $55,000 (14%) in the 2nd quarter from PAC's and other political committees; approximately an additional $90,000 reported on the same line was actually small, individual contributions funneled through conduits such as Act Blue and the Democratic Congressional Campaign Committee ("DCCC"). Not all of the candidates received such pass-through contributions. Kirkpatrick: The second-time first-term Democrat representing much of northern and rural Arizona has also been targeted by the national Republicans (the National Republican Congressional Committe "NRCC"), and she is preparing for a difficult race - although no Republican has officially filed to oppose her. Kirkpatrick collected $311,410.04 in the second quarter ($631,000 for the election cycle), and nearly doubled her bank balance from $245,000 to more than $450,000. She received approximately $47,000 (15%) in PAC contributions in the quarter, as well as a $2,000 personal contribution from the House Minority Leader, Nancy Pelosi. Barber: In a southern Arizona race that has been rated by some experts as a "pure toss-up", Barber raised $293,069.28 to bring his total contributions to more than $577,000 and his bank account grew from $327,000 to more than $550,000. Approximately $128,800 (44%) came from PACs and other political committees. He received a noteworthy $4,000 donation from retired Rep. Gabrielle Giffords' committee. Salmon: Salmon is also a second-time first-term Representative from the East Valley, and he has no announced opponents. He raised $160,166.38 in the 2nd quarter, more than doubling his total to $253,349.92. Nearly half of that (46%) is from PACs and other political committees, including $1,000 from well-known conservative big-money funders, the Koch brothers. Salmon's cash on hand grew from $140,000 to more than $243,000. Schweikert: Representing much of the East Valley, Schweikert raised $131,632.74 in the 2nd quarter - slightly less than the 1st quarter, and his total is now $273,499.28. Approximately $40,000 (30%) of this quarter's receipts are from PACs and other political committees. His bank balance grew from $94,000 to $123,000. One of his best-known contributors was Phoenix Suns CEO Robert Sarver, who maxed out (for the primary) at $2,600. Grijalva: The long-time southern Arizona Congressman raised $65,000 this past quarter, bringing his total to more than $146,000. Approximately 69% came from PACs and other political committees, and his bank balance grew slightly from $49,000 to $58,000. Grijalva has two announced Republican challengers, and we will file a report on their reports separately. Pastor: The long-time central Arizona Representative did not have to grow his massive campaign war chest, although he has not had a serious challenge in some time. He raised $64,400 ($150,000 total), of which $57,000 (89%) came from PACs and other political committees. Pastor's committee did send $25,000 to the DCCC and donated to other Congresspeople (including Kirkpatrick), and his cash on hand actually shrunk slightly, from $1,354,071.53 to $1,350,659.23. Franks: The long-time West Valley Congressman has no announced opposition, and does not appear to be concerned with his fundraising at this point. He raised just $25,000 ($67,000 total), and raised his cash on hand from just $2,848.00 to $9,496.68. 60% of the quarterly receipts came from PACs and other political committees. Arizona Rep. Raul Grijalva (D-CD3) pulled the plug on his bid to become the Democrats' ranking member on the Natural Resources Committee shortly before the entire caucus was to vote between Grijalva and Oregon Rep. Peter DeFazio. Roll Call reports on the development. Yesterday, Grijalva received 16 votes on the Democrats' Steering and Policy Committee, two more than he needed to force the caucus vote today. Arizona's Senators joined all of their GOP colleagues in voting "nay" on the confirmation of Thomas Perez as Labor Secretary this afternoon. The nomination was approved on a straight party-line 54-46 vote. Perez leaves his post as Assistant Attorney General for the Civil Rights Division, where he was the attorney who filed a lawsuit against the Maricopa County Sheriff's Office alleging "discriminatory and unconstitutional law enforcement practices." The National Republican Congressional Committee ("NRCC") is running online ads against Arizona Reps. Kyrsten Sinema (D-CD9) and Ron Barber (D-CD2), anticipatorily accusing them of putting "Washington special interests" ahead of "parents, students and teachers." The House GOP is preparing a rewrite of the No Child Left Behind Act for a vote in the next several days, in the face of "near-unanimous opposition from Democrats". The NRCC is targeting 10 Democrats across the country that it sees as being politically vulnerable in the 2014 election and on this issue. 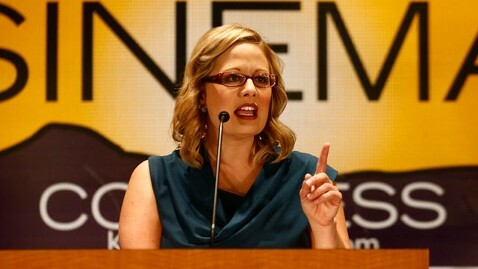 Sinema and Barber are among the NRCC's top targets. The online banner ads will be geographically targeted and focused on "education blogs." Rep. Ann Kirkpatrick (D-CD1) is also seen as vulnerable, but is probably not getting her "Back to School" picture because of the nature of internet advertising and her mostly-rural district. Arizona Rep. Ron Barber (D-CD2) sent out an e-mail (reproduced below) to supporters this morning, strongly urging them to "Stop Voter Suppression in Arizona" by joining the referendum effort to stop the election reform bill passed at the end of the Arizona legislative session and signed by Governor Jan Brewer. A coalition of groups needs to gather more than 86,000 valid signatures by September 12 to keep the law from going into effect for next year's election, and to put it on the November 2014 ballot. Among the provisions that prompted the referendum effort are changes that would require Libertarians and other third parties to obtain significantly more nominating signatures to be placed on the ballot. Arizona Reps. Ann Kirkpatrick (D-CD1) and Kyrsten Sinema (D-CD9) are among a group of more than 70 Representatives and Senators from both major parties announcing a nine-bill "Make Government Work" reform package this morning, as part of the bipartisan No Labels Problem Solvers Coalition. "I’ve often said that bipartisanship is the best way to get things done in Congress,” Kirkpatrick said. “So I’m pleased to be a part of the Problem Solvers Coalition and work with like-minded folks who are focused on results instead of rancor." A video with Democrats and Republicans, House members and Senators, matched up and giving an outline of the reform bills, is below. No Labels has been building for the past 2 1/2 years, and was influential in helping pass the No Budget, No Pay proposal last year pushing Congress to consider and pass a federal budget. Arizona's moderate Democratic Representatives - Reps. Ron Barber (CD2), Ann Kirkpatrick (CD1) and Kyrsten Sinema (CD9) - were among a small number of Democrats who voted with Republicans to pass measures today delaying the employer and individual mandates that are part of the Obamacare (Affordable Care Act) healthcare insurance law. Though today's votes will have no impact because the Senate is highly unlikely to take up the bills, they drew veto threats from the Obama Administration, and were designed by Republicans to put Democrats on the record for next year's campaigns. The bills passed by votes of 264-161 and 251-174, respectively. Reps. Raul Grijalva (D-CD3) and Ed Pastor (D-CD7) were thus the only two Arizonans to vote against the bills. Both represent districts with solid Democratic pluralities; the other Democrats represent more evenly-divided districts and have been targeted by Republican organizations for defeat next year. The Daily Beast is reporting that a California grand jury is looking into the 2012 alleged campaign finance improprieties by three conservative campaign finance organizations - two of which are Arizona-based. The Center to Protect Patient Rights and Americans for Responsible Leadership - run by Sean Noble, Arizona-based, and with ties to controversial conservative funders (Koch Industries and the Koch brothers) - are apparently under the grand jury microscope after being the subject of a California Supreme Court decision last fall. The grand jury proceeding comes several months after the pre-election Fair Political Practices Commission inquiry (and court case). ARL's announcement that the $11 million it had contributed to campaigns to opposed ballot measures in California spurred a lot of (unwanted) attention on the network of groups that seem to shuttle money around in order to shield the identity of the original contributors. ARL also spent $1.5 million in 2012 successfully opposing two Arizona ballot measures - $975,000 opposing renewing the one-cent sales tax, and $575,000 defeating the top-two primary measure. The Daily Beast reports that "the widening probe" has some "Koch allies" and conservative operatives worried, which one operative described as being "very puckered up." Arizona's Politics has been keeping an eye on the U.S. Senate's votes on nominations after the big filibuster reform agreement, and is having a difficult time figuring out Senator Jeff Flake's (R-AZ) votes. Flake was among the minority of Republicans to vote in favor of cloture (a.k.a. no filibuster) and then the nomination of Richard Cordray to be the Director of the Bureau of Consumer Financial Protection. The votes were 71-29 and 66-34, respectively. Finally today, the Senate narrowly voted (60-40) to close debate (tomorrow) on the nomination of Thomas Perez to be the Director of the Department of Labor. Flake voted with the 39 other Republicans (out of 46) voting "nay". Arizona's other Senator, John McCain - who helped negotiate the deal which averted filibuster reform earlier this week - voted "aye" on all six votes. This Politico article has more on the big picture. This afternoon, Arizona Rep. Raul Grijalva (D-CD3) got 16 votes from the Democrats' Steering and Policy Committee for the Ranking Member position on the Natural Resources Committee. That was just enough to force a vote in the entire Democratic House Caucus tomorrow (12pm, AZ Time). The 52-member SPC voted 33-16 to endorse Oregon Rep. Peter DeFazio; Grijalva needed at least 14 votes to bring it to the caucus. The two Congressmen are competing to replace Rep.-turned-Sen. Edward Markey. Here is a link to the Roll Call article. Arizona's Politics posted this article on Monday about the environmental battle. Retired Air Force Colonel Martha McSally is gaining national attention today, the day after she filed her second quarter campaign finance report showing no contributions; meanwhile, incumbent Rep. Ron Barber (D-CD2) added more than $220,000 to his campaign war chest. McSally, who narrowly lost to Barber in the 2012 general election, filed her Statement of Candidacy earlier this month (as initially reported in Arizona's Politics). She then told Politico that she had not yet made a final decision on whether to pursue the rematch. Perhaps as a result, Politico this morning ran a lengthy profile of McSally and the potential re-match in CD2, complete with praise and encouragement from Republican officials and consultants. McSally and Barber both filed their 2nd quarter finance reports last night (just posted on the Federal Election Commission website today). McSally received no contributions, but did receive a $15,000 refund from a double payment to a media firm. Hence, her cash on hand increased from $22,639.55 to the current $30,604.04. Barber raised some serious funds, nearly $300,000 ($293,069.28), and reported a June 30 bank balance of $551,639.00. No other candidates have entered this race, which is rated as one of the few "pure toss-up" Congressional battles in the country. I am very sad to learn of the passing of former Arizona Regent Esther Capin on Sunday. We had only met once or twice, but we had many mutual acquaintances and I have met other Capins over the years. Ms. Capin not only was on the Arizona Board of Regents for 15 years, but was active in other civic capacities; she also was a regular political contributor to Arizona Democrats. Our condolences to her family and friends - may God comfort you during this difficult time. In the 2nd quarter of 2013, first-term Congresswoman Kyrsten Sinema (D-CD9) more than doubled her total fundraising receipts, building up a campaign war chest for next year's election of nearly $550,000. Four Republicans have announced their plans of challenging Sinema, but only Wendy Rogers is even in the same ballpark. Rodd McLeod, a Sinema campaign spokesman, told Arizona's Politics that the Congresswoman "is preparing for the 2014 campaign, but the main focus is representing the people of the district." He noted that she is currently working hard on the issues of student loan rates and increasing the jobs base. Arizona's Politics has already reported on the surprisingly strong fundraising effort by 2nd-time GOP challenger retired Air Force Lt. Col. Wendy Rogers. Rogers' six-month contributions total (approximately $225,000) nearly matched Sinema's 2nd quarter contributions, and she has $206,438.41 in the bank as of June 30. Rogers told Arizona's Politics that she is "proud and extremely humbled that we have raised over $125,000 this quarter. In the midst of a very difficult economy, to have over 300 individual donors invest in me is an honor and a responsibility that I take very seriously. Our grassroots support grows daily and the excitement about our race is building nationwide." 1st-time candidate Andrew Walter began with an impressive fundraising total since joining the fray six weeks ago. Walter's committee reports having received $112,658.40 in contributions. He now has $122,120.37 cash on hand. Walter said, via news release, that "as a citizen candidate, I am grateful for the outpouring of support from the people of Arizona's 9th District." Former Chandler City Councilmember Martin Sepulveda is also making his 2nd attempt at the office. He filed that he has not yet raised any monies for this campaign, but that he does have $3,338.61 in the bank after paying off his 2012 campaign debts. Four key conservation biologists sent a letter today (posted below the jump) to House Minority Leader Nancy Pelosi, expressing their concern about DeFazio's proposed legislation opening up more Oregon lands to logging, and supporting Grijalva's record on environmental issues. Last week, Grijalva acknowledged that his bid faces an uphill battle, and that he hopes to be able to get enough support in Wednesday's meeting to prompt the Steering and Policy Committee ("SPC") to refer the decision to a Thursday (12:00pm Arizona Time) meeting of the entire Democratic caucus. He needs at least 14 votes for that to happen. Among the 52 members of the SPC are close colleagues Ed Pastor (D-CD7) and Keith Ellison (D-MN, co-chair with Grijalva of the Progressive Caucus). * The 52-member Steering and Policy Committee could also refer the decision to the entire Democratic Caucus. WATCH: Ted Nugent Brings "OBrewercare Fever" To Phoenix This Weekend! When he's here in Phoenix this weekend, Ted Nugent may be singing about having Cat Scratch Fever and doing the Wango Tango, but he'll be talking (screaming?) between songs about the need to sign the referendum petitions to stop the AHCCCS (aka Arizona's Medicaid program) expansion passed last month by the Arizona Legislature and signed into law by Governor Jan Brewer. The group behind the referendum effort, the United Republican Alliance of Principled Conservatives (URAPC), made the Nugent "pulpit moment" announcement in an e-mail to supporters this afternoon, urging volunteer circulators "to be there in force". Referendum proponents call the Medicaid expansion "OBrewercare" to emphasize what they see as the Governor's (and Republican legislators') support of Obamacare by accepting the federal funds. URAPC has until September 11 to collect more than 86,405 valid signatures to prevent the expansion from going into effect until Arizona voters can decide the issue in November 2014. READ: Rep. Barber Explains His (& Dems') Vote Against FARRM Bill; This Version Creates "Further Uncertainty For Arizona Farmers"
As noted previously, all Democrats - including Arizona's five Democratic Representatives - voted against the scaled-back FARRM Bill which narrowly passed the U.S. House of Representatives this afternoon, 216-208. The Farm Bill passed the House by a vote of 216-208. It is not expected to be considered by the Senate. Barber voted in June to pass a bipartisan, comprehensive Farm Bill that would have extended national agricultural and nutrition programs for the next five years. That compromise bill failed to pass the House. “When I voted to support a comprehensive Farm Bill, I called on leadership in Congress to work together and bring a bipartisan Farm Bill to the floor that can pass the House and Senate and be signed into law for the betterment of the American people and southern Arizona,” Barber said today. “This bill went in the opposite direction creating further uncertainty for Arizona and American farmers.” Today’s bill was opposed by farmers across the country, including the Arizona Farm Bureau, which has called for a comprehensive bill. The Arizona and American Farm Bureaus thanked Barber for his vote in support of certainty for agriculture in the country. Kevin Rogers, president of the Arizona Farm Bureau and a fourth-generation Arizona farmer, said: “American farmers and families need the certainty that comes with comprehensive agricultural policy. The Arizona Farm Bureau appreciates the support of Congressman Barber and his vote today in opposing the splitting of the nation’s Farm Bill.” Because today’s bill stripped out the nutritional programs from the Farm Bill, it failed to address the Supplemental Nutrition Assistance Program. In Arizona, more than 1.1 million people – 1 of every 6 – receive aid through the Supplemental Nutrition Assistance Program. More than 75 percent of those recipients are in families with children and nearly half are in working families. This article on Politico explains the larger, political picture well. Three of Arizona's four Republican Congressmen bucked their GOP colleagues and voted with the Democrats against the revamped Farm Bill. It passed by a close 216-208 vote. Rep. Paul Gosar (R-CD4) was the only Arizonan to vote "aye". As noted earlier, Rep. David Schweikert (R-CD6) was absent due to the funeral of his birth mother; however, he issued a statement indicating his strong opposition to the bill (below the jump). Arizona's other two Republican Representatives, Matt Salmon (R-CD5) and Trent Franks (R-CD8) were among only 12 Republicans who joined Democrats to vote "nay". The bill scaled back the nutrition portions of the bill in order to win votes from conservative Republicans, save face for the House Republican leadership and permit a conference committee with the Senate on a farm package. I would like to express my personal - and Arizona's Politics' - condolences to Arizona Rep. David Schweikert (R-CD6). He missed the close vote on the revamped House Farm Bill. It was not because he did not want to express his opposition to it; it was because of the funeral of his birth mother. May memories of her bring you and your family comfort in these difficult times. READ, NEW TARGET: Sheriff Joe Arpaio Needs A "New Fight"; Branching Out To Go After Hillary Clinton Presidential Run, Or Giving Up On Obama Birth Certificate? Maricopa County Sheriff Joe Arpaio said today that he is "ready to take on a new fight" and that "America is in trouble." Therefore, he is lending his clout to raise money to stop Hillary Clinton from becoming the next President of the United States. The fundraising e-mail sent out on behalf of the Stop Hillary PAC is posted in full below the jump, and indicates that he is taking on a new fight. Even with his full-time job as Sheriff, he would seem to be able to simply add this fight to protect the United States from electing a "dangerous anti-capitalist" to his current fights against the current President's alleged birth certificate forgery and to trying to thwart illegal immigration. However, he has not (visibly) attempted to raise funds recently on either the birth certificate issue or immigration. And, although he has not made any (visible*) progress on his Cold Case Posse's continuing investigation into Barack Obama's birth certificate, Arpaio's lead investigator, Mike Zullo, says that "Sheriff Arpaio is now pulling out all the stops. We are contacting and meeting with as many people as possible who can make a congressional investigation happen.” And, there is an upcoming federal court hearing in the Melendres case, on whether or not U.S. District Court Judge G. Murray Snow will appoint a monitor to prevent the Maricopa County Sheriff's Office from racially profiling in its enforcement efforts. Hillary Clinton, former First Lady and U.S. Secretary of State, has been toying with the idea of making a second run for the Presidency. Arpaio's fundraising appeal pulls out all the stops in bringing up Clinton's perceived liberal-ness - that she will "cement the disastrous policies of Obama into America's fabric forever", that Obamacare will morph (re-morph?) into Hillarycare, that she will bring us back to the economic turmoil of the Jimmy Carter era, etc. Arpaio promises to fight against the Clinton candidacy whether people contribute to the PAC or not. * There are continuing reports that Arpaio's lead investigator, Mike Zullo, is meeting with Congresspeople and "VIPs" in Washington about using the Arpaio investigation to start a Congressional investigation. The environmental group The Sierra Club has been running a cable ad urging Arizona Senators Jeff Flake and John McCain (both Republicans) to vote for President Barack Obama's nominee to lead the Environmental Protection Agency, Gina McCarthy. The ad, titled "The Brain", claims that Arizonans are sick of Washington gridlock, and appeals to the Senators' occasional moves towards bipartisanship. The National Sierra Club indicates that it is targeting the Phoenix and Cincinnati (Ohio) markets with the ad, which will continue running through the 15th. A key obstacle to a vote on her nomination fell away yesterday when Sen. David Vitter (R-LA) announced that he would oppose filibustering McCarthy's nomination. A couple of other GOP Senators are still outspoken in their opposition to her. Let's take a look at what the average Arizonan thinks about Washington: gridlock, partisan bickering and no one working to protect our families from dangerous pollution. So do Senators John McCain and Jeff Flake agree with our state? Let’s find out. Call Senators McCain and Flake today: ask them to support Gina McCarthy to head the EPA. Arizona's Senators Jeff Flake and John McCain spoke on the Senate floor this afternoon about the 19 Granite Mountain Hotshots who were killed fighting the Yarnell Hill fire on June 30, and the U.S. Senate unanimously passed a resolution honoring the wildfire firefighters. The text of Senate Resolution 193 is not yet available, but will be posted here once it is. “I rise today with a heavy heart to remember 19 brave men, 19 grieving families, and 19 empty places in the Prescott community that will never be filled. Arizona, and the whole nation, shares in their sorrow. The loss of these members of the Granite Mountain Hotshots, and the loss to the community, was both terrible and swift. We are right to ask why. Why were they taken from us? And why would these seemingly fearless men, these exemplars of all that is brave and good and decent in men, choose a job that causes them to run into an inferno that everyone else is running away from it? In answering that, we get at the essence of who they were, these 19 lives of achievement and purpose, courage and discipline. From all corners of America, they came together in Prescott with a single goal in mind: protecting people and property. They did so in the name of community. Americans are characterized around the world by our sense of communal spirit, civic duty and service to others. This is what makes us who we are. And those characteristics describe perfectly the 19 members of the Granite Mountain Hotshots. They were not merely given the gratitude and respect of the citizens of Prescott – they earned it. They earned all of our admiration, and respect as well. Now, in that same communal spirit, we must help their families that carry the weary load. Grief is a lonely thing. But to those who are grieving for a husband or a son, know that millions of us are thinking of you and praying for your hearts, that they find solace and comfort. To the children of these men, carry deep inside you the knowledge that they were as proud of you as you are of them. This band of 19 embodied what is best about our country. I am honored that they were, in the end, Arizonans. We should all be proud to live in a community and a state and a nation built on the kind of guts and selflessness that these men personify. Today we are all, in the words of A.E. Housman, “townsmen of a stiller town.” May God bless the souls of these 19 brave men. Senator McCain and I had the privilege yesterday to travel out with the vice president, two cabinet secretaries, and other members of Congress, to a memorial service for these brave 19. It was an incredible experience, to see a community come together as it did. Townspeople, people from across the state, form across the country, and people across the world sending their condolences for these men. We are so fortunate to live in a country like this. Senator McCain and I are so fortunate to be Arizonans. And we are fortunate to witness what we have witnessed in the past couple of weeks. Mr. Speaker, we, the Arizona delegation, rise today in the wake of the tragic Yarnell Hill Fire that has left our hearts, the hearts of Arizonans and the hearts of Americans across the country overwhelmed with disbelief and sadness. This was the largest loss of life of first-responders since 9/11. The town of Yarnell and the people of Arizona will never forget and will forever honor the 19 heroes of the elite Granite Mountain Hotshot fire crew who lost their lives in an act of self-sacrificing bravery. Out of my deepest respect for these fallen heroes, their families and the communities of Prescott, Peeple’s Valley, and Yarnell I ask that you continue to keep them in your prayers. And, I now ask you to join me and my colleagues for a moment of silence to honor the Yarnell 19’s ultimate act of courage and sacrifice. WATCH: Reps. Grijalva and Pelosi On Immigration Reform In the House; "Border Security" Must Include "Humanitarian Support"
"The definition of border security has been hijacked to mean how many, what armaments, what technology. The Border Caucus feels that the definition for the borderlands of security is expansive and includes economics, it includes the humanitarian support." Saw Arizona hometown boy Dierks Bentley when he was in town last month, and just wanted to post his announcement that he is going to headline a benefit concert this month for the families of the Granite Mountain Hotshots who were killed June 30. Since we are busy updating on challengers for Arizona's Congressional seats, as well as incoming quarterly finance reports - it is important to note the latest ratings of how contested Arizona's seats are. You will recall that Democrats won the three very close post-redistricting Congressional races last fall in Arizona - Rep. Ann Kirkpatrick re-taking a seat in CD1, Rep. Ron Barber holding on to his southern Arizona seat in CD2, and Rep. Kyrsten Sinema moving from the state's legislative body to the nation's representing CD9. The widely-read and respected Rothenberg Political Report rates Barber's seat as one of four "Pure Toss-Ups" in the entire country. Martha McSally is the only announced GOP challenger to date. Rothenberg lists Kirkpatrick's district - which encompasses much of rural Arizona - as one of five "Toss-Up/Tilts Democrat" seats in the country. State Rep. Adam Kwasman has announced an exploratory committee to challenge her. Finally, Sinema's central Phoenix/East Valley district is listed as "Democrat Favored". However, she already has four announced GOP opponents. Arizona's other six Congressional seats are safely in the hands of the incumbents - four Republican and two Democratic. Retired Air Force Lt. Col. Wendy Rogers is flying to the front of the pack of Republican challengers to first-term Rep. Kyrsten Sinema (D-CD9), posting approximately $225,000 in contributions in the first six months of 2013. Rogers is the first of the four formally-filed Republicans to post her second quarter finance report with the Federal Election Commission ("FEC"), and she more than doubled the cash she has on hand from March 31 to June 30; Rogers has $206,438.41 in the bank. Rogers will need the money. Not only will the primary be hard fought, but first-term Rep. Sinema has the fundraising power of incumbency. Although she has not yet filed her second quarter report, a media report indicates that she raised $400,000 in the quarter and has $550,000 cash on hand. Who's Officially Running For Arizona's Congressional Seats In 2014 (and Beyond)? As candidates and committees begin filing their quarterly finance reports, it is a good time to take a quick look at who has actually filed his or her Statement of Candidacy for next year's Congressional elections. First, and most easily, ALL of Arizona's current Congresspeople have filed to run for re-election. They need to in order to raise any money, as Reps. Trent Franks and Matt Salmon found out in May, when the Federal Election Commission ("FEC") sent them letters giving them 35 days to file their Statement of Candidacy, as their committees had already been raising funds. Even Arizona's two Senators - John McCain and Jeff Flake - have filed their Statements of Candidacy. McCain is not up for re-election until 2016, and Flake is already running for 2018. As Arizona's Politics noted earlier, Flake is already holding fundraisers. *State lawmaker Adam Kwasman (R) has announced an exploratory committee, but has not filed with the FEC. Arizona Senator John McCain (R-AZ) took his turn on CBS' "Face the Nation" program this morning. He used the situation in Egypt to reiterate his criticism of President Barack Obama's leadership. If you prefer to watch the entire program, here's a link. A transcript of the McCain interview is available at this link. SIGN, SIGN, EVERYWHERE A SIGN: Firefighters Union Pays For Signs To Claim That Lobbyists and Developers Support The Opponent! New signs that sprouted up during the Independence Day holiday around Ahwatukee, the Arcadia are and central Phoenix kick the Phoenix City Council race between incumbent Councilmember Sal DiCiccio and challenger Karlene Keogh Parks into a new dimension. The signs pretend to be supporting the incumbent, but are claiming that "lobbyists" and "developers" are behind DiCiccio - two groups that candidates do not generally put front and center. DiCiccio (City Council District 6) has claimed that Government Union Bosses (his term and his caps) are the ones out to prevent him from winning re-election, and has pointed - as recently as today - to the Campaign for Better Neighborhoods ("CBN") as evidence (see, DiCiccio's Facebook page). But, the signs are put up by a new political committee called "Phoenix Truth and Safety" ("PTS") that is upfront about its origins. The signs disclose at the bottom "Paid for by Phoenix Truth and Safety with major funding provided by Arizona's Firefighters, 61 E. Columbus ave (sic) Phoenix AZ 85012; Contact Don Jongewaard 602-277-1500. Not authorized by any candidate or candidate's committee." Unlike CBN, PTS has filed with the City of Phoenix Clerk's Office as a Political Committee. (The Statement of Organization is reproduced below.) The Chair of the group is Don Jongewaard, the President of the Tempe chapter of the Professional Firefighters of Arizona, and the Treasurer is Anthony Butch, a Glendale firefighter listed as a Staff Representative for the PFFA. The listed address for PTS is the headquarters for the PFFA. The PTS website is a compendium of all of the attacks against DiCiccio from various sources. The new signs are more clever than usual, considering that they came days after the "firefighters", "police" and "paramedics" supporting Parks signs blanketed the district, and that they almost - but not quite - mimic DiCiccio's signs' color scheme. The tactic does have some risk, in that signs are generally used chiefly to bolster name recognition - and these signs only display the name of their intended target. Not everyone reads - or, thinks about - the message of the sign, though the name may stick in their brain.